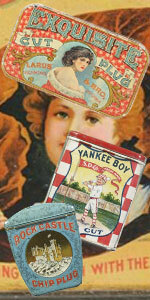 Our site has the internet’s most extensive galleries of rare and valuable tobacco tins and cigar tins, as well as tobacco related advertising signs. While our site doesn’t have every tin that’s out there, we do have most of the ones of interest to the high end collector. We are here to help you in your collecting endeavors so feel free to Contact Us, Join Our Mailing List, or just Browse the site! We are collectors of tobacciana and we really love these items! We will offer to buy single tins or entire tobacciana collections depending on your desires. If you found your tin or sign in one of our image galleries and it’s in fair to good condition, it’s very likely that it’s valuable and we will probably make you an offer for it. We make aggressive offers for rare or high-grade items and we do hundreds of deals every year, usually beating out offers from other dealers and collectors. 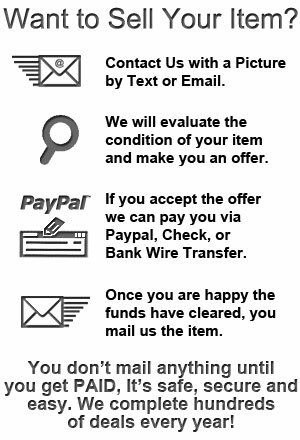 For the fastest help you can text pictures of your item to 404-606-2648 or email to Dale@AntiqueTobacco.com, once we’ve gotten some pictures we will respond and help however we can. 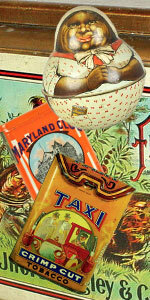 As a service to collectors, experts, and novices alike, we offer free appraisals for signs and tobacciana items. Whether you’ve just inherited something and need to know what it’s worth, you found something you’re interested in and don’t know what to pay, or you are just curious for information about your item, feel free to contact us with pictures and we can help you by providing an estimated value based on rarity, condition, and current market trends.